In December 2009, the staff at Rigor Mortis learned about Z.A. Recht's passing. I want to get something out of the way before I launch into this piece -- I did not know Z.A. Recht personally. I am just an artist writing as a fan of his work. I did share a couple emails with him and more recently his Mom was gracious enough to correspond with me in all my coffee-induced ramblings. When I approached her with the idea of doing a little dedication to him, she was more than helpful. She supplied stories, images, and gave me a fuller picture of Z.A. Recht as a person and son. I can't thank the Recht family enough for sharing during this painful time. Above it all, I could never call him Zach, as his friends and family do, since he only ever signed our emails Z. Yet now, I feel like I know the guy in a sense. So it is to Z that I am writing this. I'm sorry I never had the chance to make your acquaintance. I think it's important to first give some insight as to where I am writing from and for that, please indulge me, as I need to speak of my own experiences for a minute. I loathe to think anyone reading this will assume this is just another one of those obligatory "memorial" pieces -- where the person writing has no idea what sudden loss is or is doing it for the drama credits. The day I opened my email to find my editor's message proclaiming "what the..." that announced Z's passing, I was truly shell-shocked. I do not EVER take these things lightly -- especially in this case where Z's fictional world thoroughly engulfed me and we had actually been corresponding. I didn't need to know him for that news to hit me like a ton of bricks. I had flashbacks to other mornings in which I'd awoken to find someone I'd cared about had left this earth. In one case, I was just getting ready for work and in the next moment I found myself unable to resuscitate a friend and was left to sit with his body for hours waiting for the coroner. I spent that time speaking and holding my prone friend as if that was going to bring him back. Another time I woke to find I was being called to identify a friend downtown. As if that wasn't enough, I've had mundane days that turned into racing to a hospital six hours away because my 35-year-old partner was in a coma having suffered life-threatening bi-lateral strokes. Currently, my muse for parts of this issue is sitting in a coma. She too, like everyone else I spoke of, was walking, talking, and doing all of the stuff you do "just the other day". I won't bother with the suicides, murders, and overdoses -- I think you get the picture. My point is: No matter who the person is, you think to your own losses and can empathize with pain the family is going through. When you've had enough life experience, these reactions become automatic and genuine. It makes no difference whether you know the person or not. This is why Z's loss did in fact impact me. Obviously not to the extent of those close to him, but as one who has experienced sudden loss. Also, as a fellow creator I see and mourn the loss of so much promise as evidenced in his first two books. In hindsight, I would never have guessed from his writing that Z was a 20-something kid living in West Virginia. I mean that as a compliment and also from a place of sorrow, because if PLAGUE OF THE DEAD and THUNDER AND ASHES were his first two books and he was that young, he had so much left to write. The Morningstar Strain trilogy, which started with PLAGUE OF THE DEAD and THUNDER AND ASHES, will be completed in early 2011 with the release of SURVIVORS by Simon and Schuster. Again, he was a young fiction writer that achieved something few people do by first being published by Permuted Press and then later having rights to his books and a future works bought by a major publisher. Z also wrote for The Journal, a newspaper based in Martinsburg, WV, and worked a number of odd jobs before turning to writing full-time and helping on his family's property and also a farm in Virginia. He also completed boot camp for the US Army and was an expert sharpshooter. He learned to read quite young and loved E. A. Poe., H. S. Thompson, J. R. R. Tolkien, R. Heinlein, Brian Jacques, and Shakespeare. He was also a major history buff. At this time his family would like his cause of death to remain private and that should be respected. Z is survived by his parents, Keith and Mary, and his siblings Adam and Alison. In closing, I feel it is important for all of us to remember to cherish the artists and creators in our lives. So many times I've seen their gifts taken for granted and used by others who place no value on the uniqueness of their talent. Often people ask a creator to write or draw something, as if they're borrowing a cup of sugar. These gifts, such as Z's writing, are portals into the mind's eye of the creator. Viewer's have no idea what demons are being excised to bring the viewer their own moments of escape. We would not have the privilege of this escape into another world if the creators were not generous enough to share their visions with us. That said, thank you Z, for creating people and places many of us believed in and certainly want to revisit with the conclusion of the trilogy this coming year. they show us that our lives, however disappointing we might find them to be, could always be worse. At least there aren't zombies outside your front door, Zombie stories with their dismal atmospheres and pervading hopelessness make us feel good about where we are in life." Z-BAR: J-Bar in Aspen, CO was a hangout of one of Z's favorite authors, Hunter S. Thompson. Z's got his own place now, Z-Bar. The glass he's holding is based a favorite gift from J-Bar. TOP ROW OF MONSTERS: Bela Lugosis Murder Legendre from WHITE ZOMBIE (the first Zed film) standing next to Fulcis zombie. Next to him is Leon from RESIDENT EVIL, representing the progression/evolution of the Z genre. George Romero, of obvious zombie historical significance, but also an icon to Z. In Romeros hand is a bottle of Grey Goose. At Z's memorial, everyone raised a glass of Grey Goose to Z.
INVERTED FLAG: Z displayed a flag at his home and it was also used at his memorial. Z did not agree with many actions of the Bush administration and often hung the flag upside down in protest. It was his own political statement that said a lot about his love for his country and how he saw our politicians. TWO MEN RIGHT: Buzz cut guy is based on Sam Elliot in WE WERE SOLDIERS, the inspiration for Z's character Thomas, and the other is based on Col. Sherman Potter from MASH, who inspired Z's character Sherman from the books. He is holding a 9mm, standard zombie protection and featured prominently in the books. CHILDHOOD Z: a favorite photo of his mother's. Z'S ADULT IMAGE: A well known shot of him and one of his favorites. On his jacket are patches of Conrad Brooks (PLAN 9 FROM OUTER SPACE), who was a friend and neighbor of Z's, the logo for Permuted Press, Morningstar, and a pin for Habitat for Humanity, where Z volunteered. T-SHIRT LOGO: Lynyrd Skynyrds Free Bird was played at memorial and was a favorite song of Zs. This is the single's art. TABLE: is actually an army trunk, referencing Z's bootcamp time. On the trunk are chess pieces referencing some of his favorite places, skills, activities and his dog. 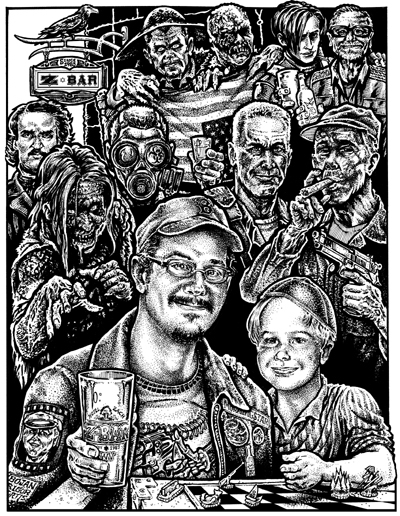 GAS MASK GUY & ZOMBIE REACHING FOR GLASS: These characters on the THUNDER AND ASHES covers.